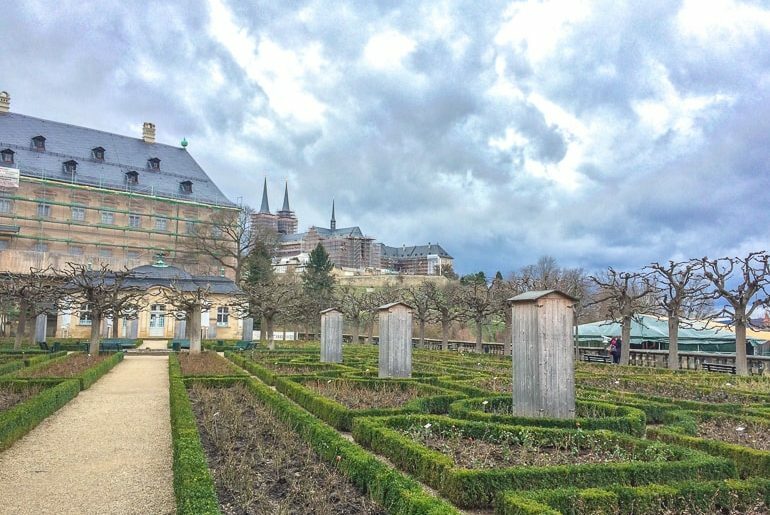 Let’s Explore Some Awesome Things to Do in Bamberg! 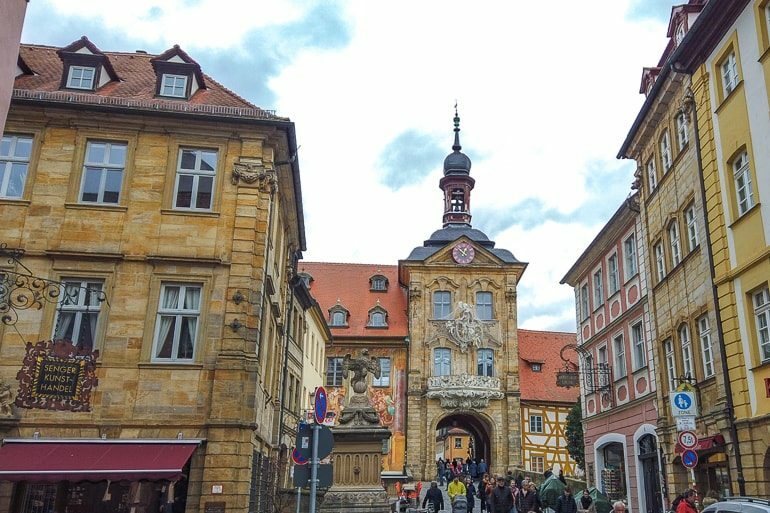 Is Bamberg, Germany worth visiting? We think so! This small town just a short trip from Nuremberg is known by many names – one of which is the Franconian Rome. The town is full of rich history – like the famous Altes Rathaus – which makes sense since it was founded over 1,000 years ago! We had the chance to check out the town for a day as we were passing through that area of Germany. Lisa had been a bunch of times before – but not Eric. Honestly, Eric fell in love with the place. We did our best to see and do as much as we could but we obviously missed some things so we really want to go back. From a Bamberg walking tour and Altenburg Castle to the Bamberg Cathedral, there is plenty to do and see! You might leave having tried the famous “Smokebeer” or having bought some great Bamberg/Franconian souvenirs. 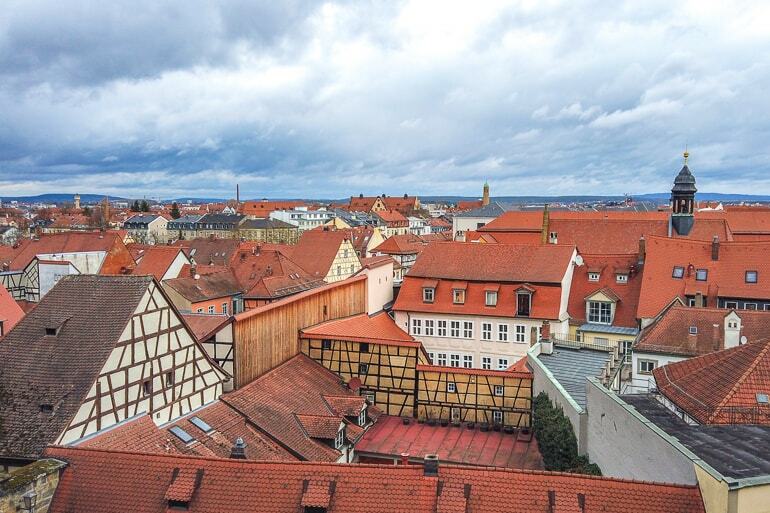 That said, Bamberg is known for its authentic charm which makes it perfect for our “Germany’s Hidden Gems” series. In case you want to get a first impression of how beautiful the Old Town of Bamberg looks, you can watch the following video snippet. You can find the whole video on our YouTube Channel here. If you’re travelling to Germany for the first time and need some more ideas, here’s some inspiration! Brush Up On Your German Phrases before you go! Discover Other Gems like Coburg, Würzburg, Aschaffenburg, Aachen! A Day Trip from Frankfurt: Wiesbaden and Mainz Are Calling! Bamberg is located in the northern part of Bavaria, a region called Upper Franconia. It is actually very close to where Lisa grew up – that’s why she’s visited the city so many times before. Bamberg is roughly 2.5 hours southeast of Frankfurt am Main, about 2.5 hours north of Munich, and approximately 4 hours southwest of Berlin. 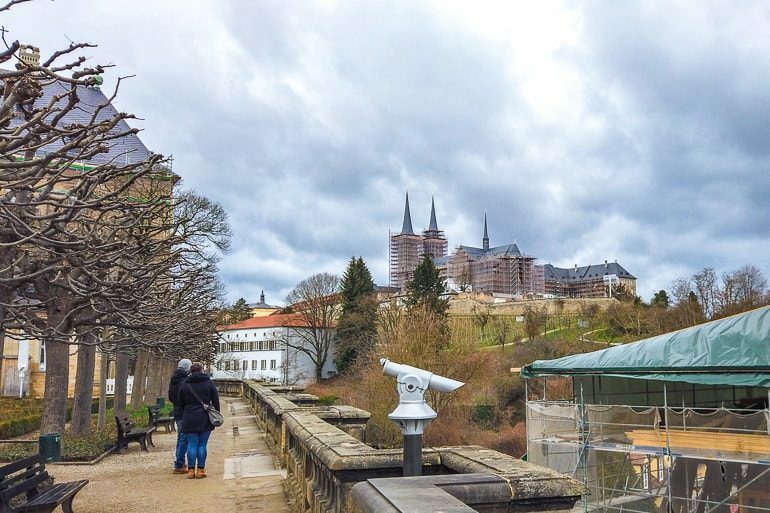 It is actually quite close to other places that we have mentioned in our “Germany’s Hidden Gems” series before such as Aschaffenburg, Coburg, and Würzburg. That’s why we think a short road trip would be a great way to discover this region – and we’re planning on writing a more specific guide about this soon! See More of Germany – Beautiful Places in Germany Told By German Bloggers! The town from up near the Cathedral and New Residence. Even though Bamberg is not a huge city, it is actually quite well connected with the national train and bus system. Depending on where you are coming from and which mode of transportation you prefer, there are a few options as to how to get to Bamberg. If you have your car with you and/or are planning on exploring more places in the surrounding area, then travelling to Bamberg by car is certainly an option. There are lots of parking garages close to the city centre which are actually not that expensive. One thing we would recommend you to avoid, if possible, is to drive through parts of the Old Town (there are only some roads that are open for cars anyway). The streets there can be super narrow and with that many pedestrians around, it can be a stressful experience. If you are coming from abroad and are considering renting a car, you can check here for rental car prices. A good option would be to fly into Munich or Frankfurt, pick up your rental car and start your road trip to Bamberg. It’s easy to get to Bamberg by train as it is very well connected. Most of the time, you’ll find a direct connection or connections with only one change. If you’re travelling to Bamberg from the south of Germany such as cities like Nuremberg and Munich you’ll have a pretty easy and straightforward journey. From Munich, you can take an ICE (the fast train) to Bamberg in only 2 hours. However, if you haven’t booked your tickets in advance, this train ride can get a little expensive. If you are on a budget and/or aren’t short on time, then you could avoid taking an ICE and just travel with regional trains instead. This would take slightly longer but can end up being cheaper, especially if you are travelling as a group. With this option, you would likely change trains in Nuremberg. For travel on regional trains within Bavaria you can (and should) buy a Bayern Ticket which is a ticket for 1 – 5 people that is valid for one day for an unlimited amount of travel on regional trains within the state. You can find a train connection that works for you and book your ticket at the Deutsche Bahn Website. If you’re travelling to Bamberg from Frankfurt am Main or cities close by, then you can also take a regional train which takes approximately 3 hours. For this journey, you can also buy a special ticket called Regio-Ticket Main-Spessart Plus Frankfurt which works similar to the Bayern Ticket but is valid for a different geographical area. Once again, you can check the train schedule and book your ticket at the Deutsche Bahn Website. You could also take a Flixbus to and from Bamberg. Surprisingly, Bamberg is directly connected to Berlin, Munich, even cities like Amsterdam and Prague (via one or two changes). The point is – you can get to Bamberg using the bus. In fact, Lisa took the Flixbus from there numerous times since it’s so close to where she grew up. You can check the Flixbus Website to see if there is a route that works for you. Bamberg has a very long history. As we mentioned above, the town was founded over 1,000 years ago so it would be hard to cover everything! In short, the town served as a “Second Rome” for the King of Germany in 1007. 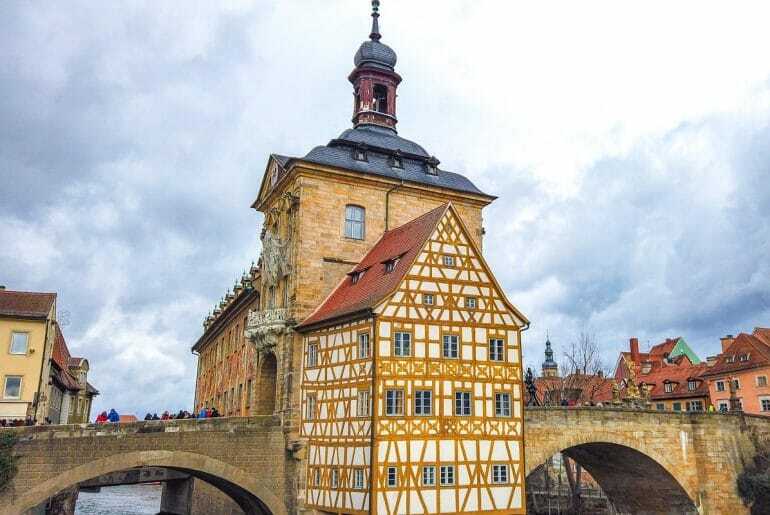 It’s been said that the medieval and baroque architecture of Bamberg influenced the buildings in northern Germany and Hungary from the 12th century onward! Because of all incredible history and the extensive restoration works over the years to preserve the town, Bamberg (and specifically the Old Town) was declared a UNESCO World Heritage Site in 1993. As you walk about Bamberg, you feel like you’re transported back into another time centuries ago – it’s pretty neat to experience, honestly. Want the City? Check Out Hamburg for a change of pace! 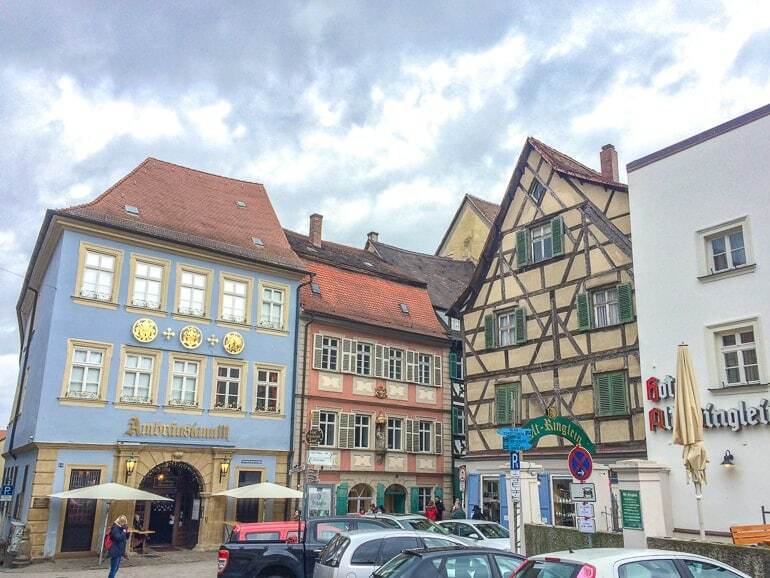 The beige building on the corner is Palais Schrottenberg – right in the beautiful old town! Even though Bamberg is a smaller city, there are still plenty of accommodation options to choose from. That said, many of the hotels and guesthouses are located in the city centre – with lots of them right in the old town. There are also different places to suit your budget or style. You can check for Bamberg accommodations here. You can check out the Welcome Hotel Residenzschloss Bamberg for a stay right by the river or Palais Schrottenberg for a stay in the heart of the Old Town. Bamberg is great because there’s a calming, leisurely pace about the city. You lose yourself among the river walks, statues, colourful buildings, and cobblestone streets. It’s nice. 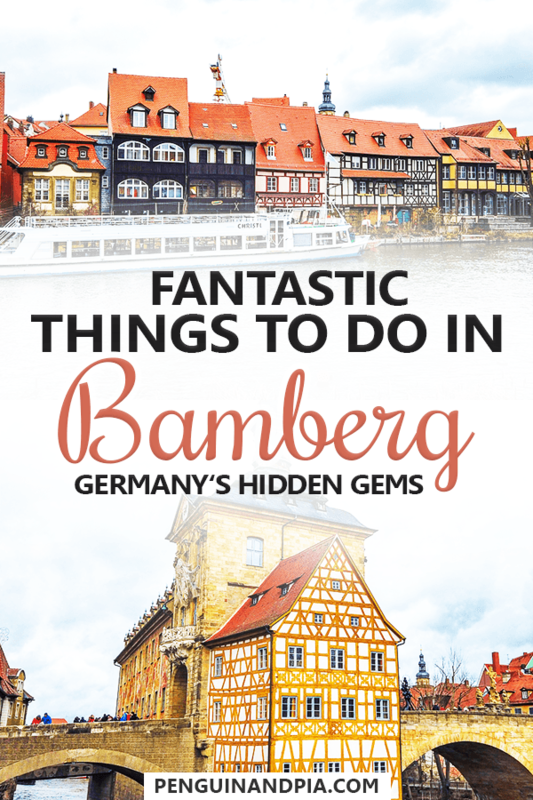 Since there are lots of things to do and see in Bamberg, we will mention the things you should do when you’re only in the city for a short amount of time. Of course, there are other smaller museums and whatnot but we wanted to focus on the top attractions and sights. 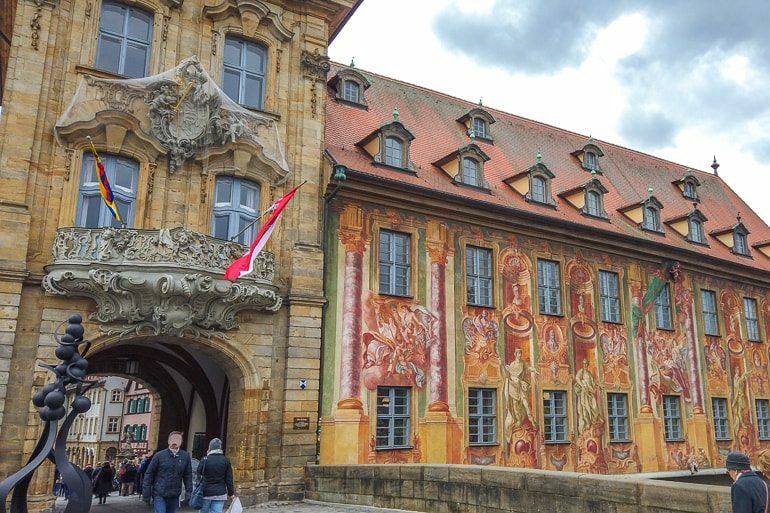 Many people come to Bamberg for the historic Old Town – and this makes a ton of sense! The whole area feels like you are being transported in back in time to the medieval ages. There are loads of gorgeous buildings, churches, statues, fountains, and sculptures that you can check out as you go. The Old Town isn’t massive – and we will talk about the “newer” market area later in this post – so you can wander around and see a big part of it in a short amount of time. That said, a good first stop, if you are new to the city, is the Bamberg Tourism Centre. Located on its own little island in the heart of the city/river, you can find lots of useful information and staff that can speak English if you want to get your bearings for what to see and do. If you want to learn as much as you can while you are there, you might consider a guided walking tour of the Old Town. We ran around looking at pretty things and while we did read the information boards and signs, sometimes a live person is just so much better to learn about history! Explore Bamberg Like A Pro! – Get the BambergCard, a 3-day pass which gets you a guided city tour, acts as a transit pass, and allows for discounts on visits to up to 7 museums! The Altes Rathaus drawing crowds – as per usual! Of course, no visit to Bamberg is complete without a stop to see the Old Town Hall. Known as the “Altes Rathaus”, this building is easily one of the most photographed buildings in the whole city. We can see why! Originally built around the 1460s, the building itself is part of an interesting historical fact: the Bishop at the time didn’t want to give up land for the Town Hall. That’s why the citizens created an artificial island in the middle of the Regnitz River so that it could be built! Elaborate frescos on the outside and a walk through the archway connecting Obere Brücke (Bridge) to the Old Town. These days, the outside has been decorated by gorgeous frescos. There are different pedestrian bridges connecting the small island which makes photo-taking super fun and allows you to catch the building at different angles. Inside, you can find the Ludwig Collection, which is a porcelain museum you can check out for a fee. We didn’t go inside but the photos look really pretty if you are into fine artwork! This is just a section of “Little Venice” – can you see why it got the name? 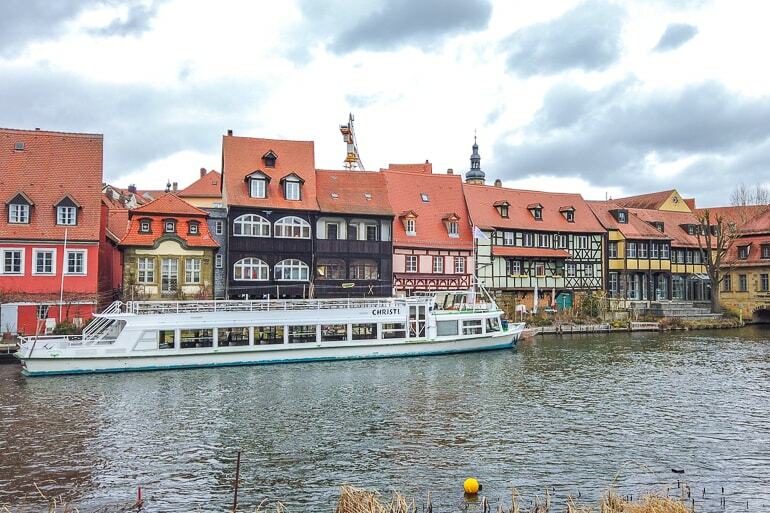 There are many top sights in Bamberg – and undoubtedly one of them is “Little Venice”. Known as Klein Venedig in German, this small fisherman’s district is located on the island in the city centre. It weird – you don’t really realize that the “New” parts of the city with the market is on a large island that sits between the train station to the east and the Old Town to the west. In any case, this area of small timbered houses sprung up in the Middle Ages and today stand as a pretty reminder of the city’s rich history. They are also a reminder of the importance that the river has had on shaping the city and the region, in general! If you want to explore the city by the river, you can actually do so on a boat cruise. Lisa has actually done that during a high school trip and remembers it being a great experience. You can learn more about them here. The Cathedral is massive – couldn’t get it in one photograph! 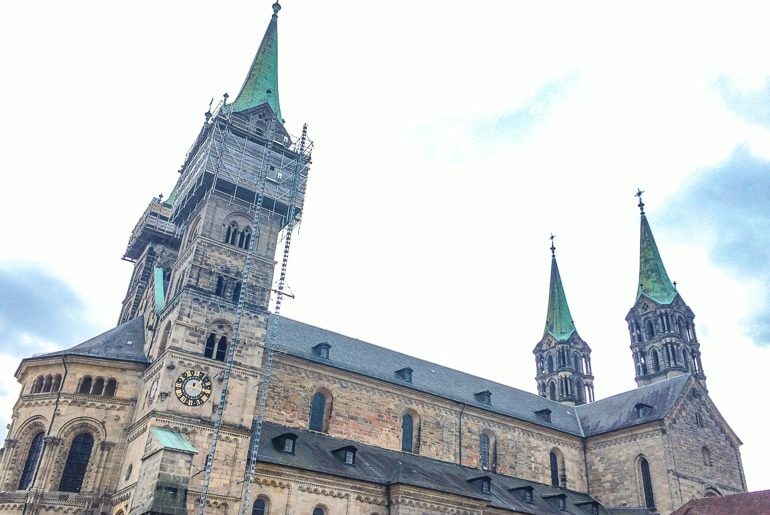 You cannot come to Bamberg and not visit one of the most iconic landmarks: the Bamberg Cathedral. Known in German as the Bamberger Dom, this massive stunning piece of architecture sits atop the hill with many other of the top attractions such as the New Residence and the Old Court (which we will mention below). Originally commissioned to be built in the year 1002 by Emperor Heinrich II, the first structure actually only took 10 years to complete! This building and the next one were both destroyed by fire. The one you see today is the third building – and you can really tell the Gothic and Romanesque style from the 13th century. Inside there are a few notable things to check out: the tomb of Heinrich II. and the “Bamberg Horseman” – a sandstone wall carving of a full-sized horse and rider that is claimed to be the oldest medieval carving of a horse! There are also guided tours frequently during the week in which you can participate in. You can find more information here. (Please note: The website is in German only, but you can translate it into English by using a Google Chrome Browser). Since it’s an active place of worship you are asked to be respectful and silent when inside. When we visited, the outside was covered in some restoration works – but it’s great to see that they are keeping the cathedral in great condition. The main entrance to the Residence buildings. 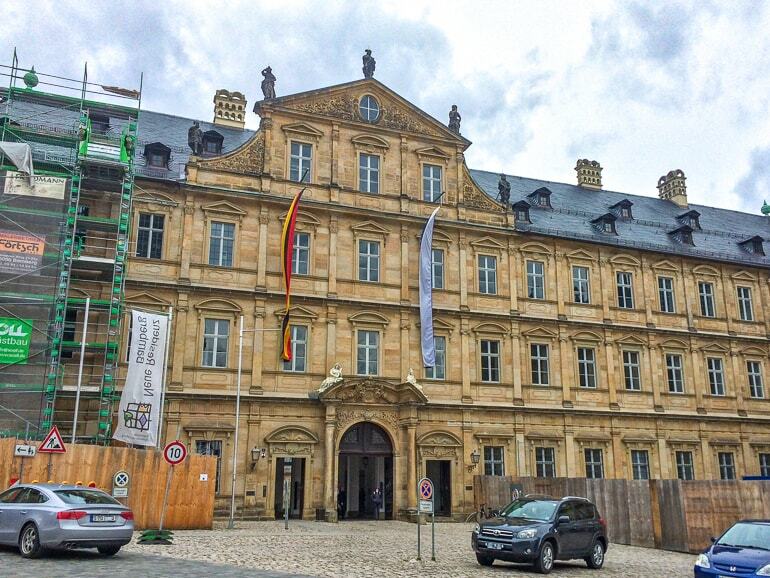 If you want to dive into a bit more of the history of Bamberg and learn about its royals (basically the bishops), you should check out the New Residence. Called the Neue Residenz in German, this massive four-winged complex was actually constructed in two stages between 1602 and 1703. This is why you can see that there’s a Renaissance style in the back portions while the Baroque portions face the Cathedral (what you see above). In total, the complex has over 40 staterooms with lavish artwork, stucco work, tapestries, and furniture. There are also guided tours that take you around some of the most interesting rooms in the residence including The Elector’s Rooms, Prince-Bishop’s Apartments, and the art gallery with German and Baroque paintings. The Rosengarten – not in bloom, yet! For added beauty, you can visit the Rosengarten (rose garden). This large symmetrical garden in the courtyard has over 70 beds and over 4,500 roses when in full bloom. There’s even a cafe that you can enjoy a tea or coffee at. This is something that Lisa hasn’t even done so we want to check it out during the warmer months. Eric just loved the views out over Bamberg from the walls high up! The “Beautiful Gateway” carving is stunning to look at – be sure to pause and appreciate it! 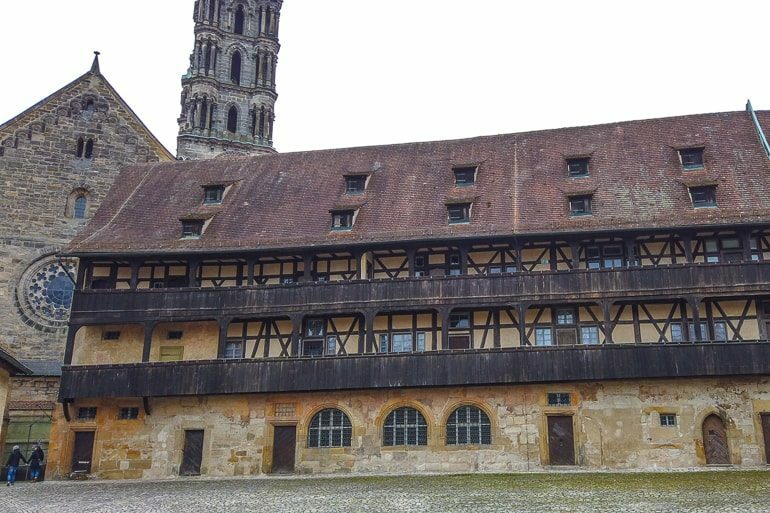 Known in English as the “Old Court”, the Alte Hofhaltung is a medieval complex that served as the Residence of the bishops until approximately the 17th century. That’s when the New Residence took over the role. Isn’t history fun?! Before the building you see today was there, something called the Castrum Babenberg stood in its place. This is back in the very early 11th century, though. After that burnt down (in the Cathedral fire of 1185), they built another building – which was then replaced in the 16th century by the half-timbered Renaissance buildings you see today. The authentic look means the inner courtyard has been used as a film set which is pretty cool! To get into the medieval complex, you pass through the”Beautiful Gateway”. Sculpted by hand by Pankras Wagner, the gate is loaded with figures and details. It’s pretty stunning when you stand there and realize how much work went into it. 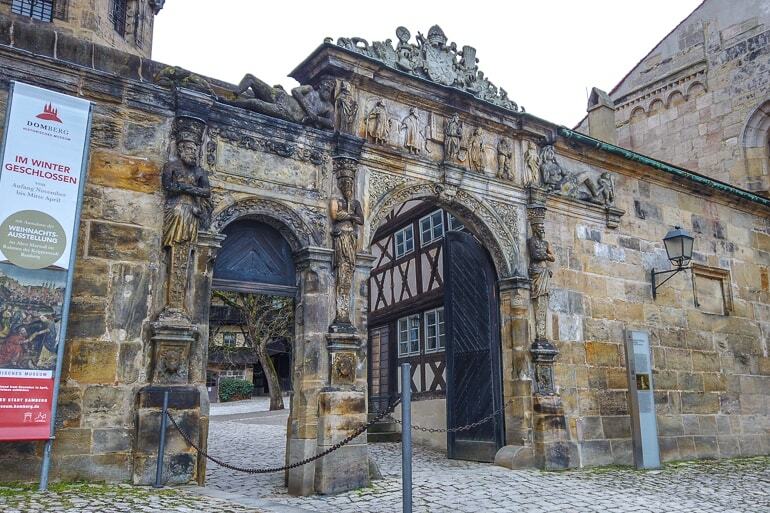 Today, the Old Court complex accommodates the Museum of History (Historisches Museum) which you can visit to learn all about Bamberg’s long and fascinating history! You can also visit smaller rooms and chapels in the complex for a fee. You can learn more by visiting this website. There sits Kloster Michaelsberg – shrouded for now for important restoration work. Known as Kloster Michaelsberg in German, this abbey was originally founded in 1015 but the structure that stands today is of Baroque architecture from the 18th century. The structures in-between were destroyed by an earthquake and then by fire in the 17th century. Talk about bad luck! As of right now (March 2019), you can’t go inside because there is extensive restoration work happening – expected to finish in 2021 at the earliest. That said, you can admire the outside and wander the beautiful grounds/gardens with fountains, pavilions, and views of the city below! Grüner Market in full swing on a Saturday – despite the rain! 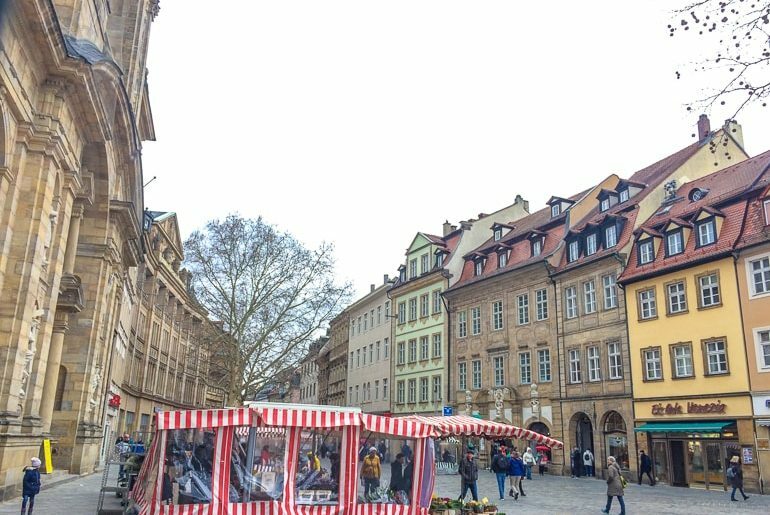 If you are out for a wander and done with parts of the Old Town, head north of the Old Town Hall and wander through the Green Market. Known as Grüner Markt in German, this pedestrian-only zone is great for shopping. There are lots of shops and places to check out for things to buy as well as eat or drink. As you walk along, you will find that the market area is lined with pop-up shops selling everything from fruit and vegetables, to fresh flowers, honey, and more. You can find these pop-up tents Monday to Saturday – and there are even food stands for a fresh bratwurst if you are hungry! There are fountains and gorgeous architecture as you walk along so just walk slow and enjoy the area. 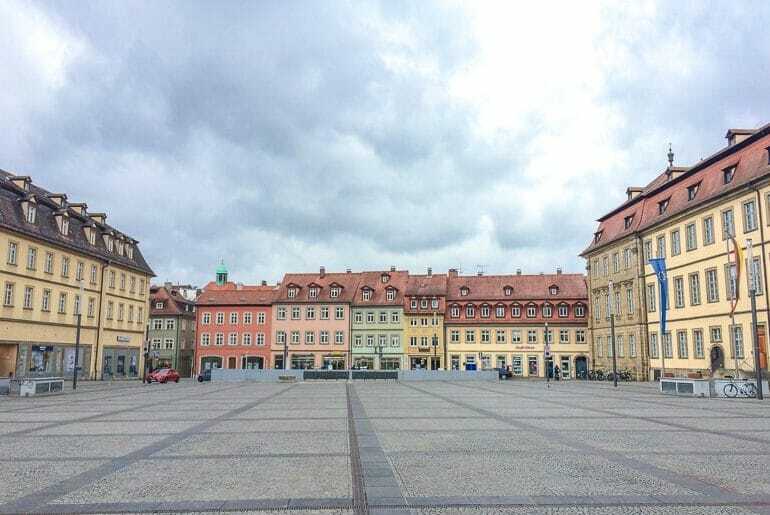 The large Maximiliansplatz was empty when we visited – still pretty to see! You will eventually come across the large public square known as Maximiliansplatz. In it, there’s a large fountain (Maximiliansbrunnen) which is beautiful to look at. The square also has the City Government Office located right on it – hence the EU flags. It was nice to have the square to ourselves and snap a few nice photos. 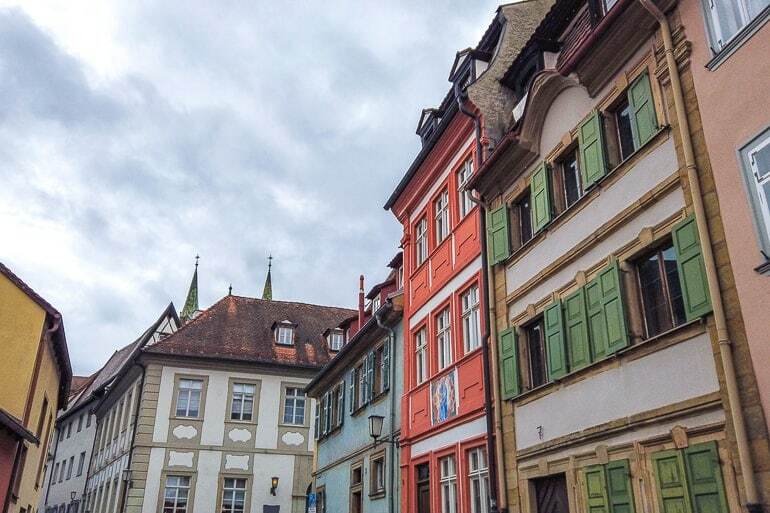 It made us realize how this “modern” side of Bamberg was also super beautiful and that it should be explored, too! “Love Locks” accumulating on the bridge into the market area. 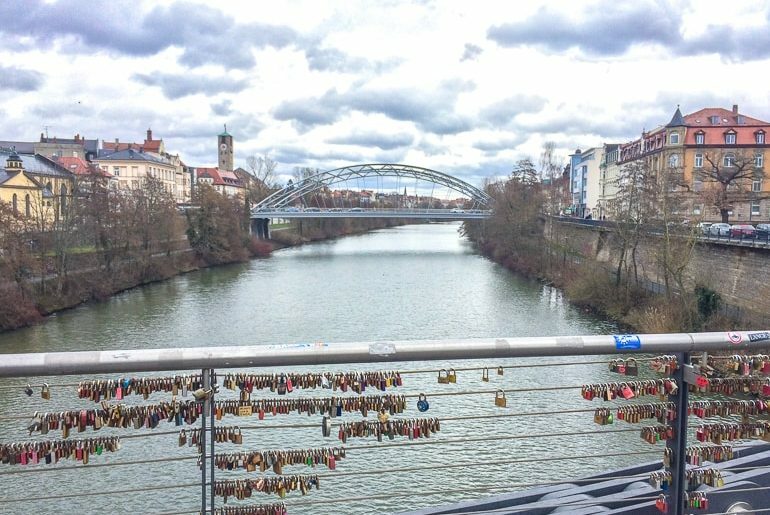 If you are out for a walk (or maybe coming from the train station) and heading for the Old Town, then you might cross the Kettenbrücke. If you do, check out the love locks. The bridge itself isn’t fancy or unique, just full of locks. It’s cool to see and photograph if you are into that sort of thing. As we said, this bridge is also useful because you can use it to access the central train station (Bamberg HBF) which is in the newer part of town to the northeast of the Old Town. Compared to the bridge in the photograph above, this bridge also directly connects into the new market area (Grüner Market) with the shops and produce stands. So, it’s functional, too! One of the other top attractions to check out in Bamberg is Altenburg Castle. This castle is located outside of the city centre to the southwest and sits atop Bamberg’s highest hill. The castle was first mentioned in the early 1100s and has served a few functions over the centuries. In the 14th and 15th centuries, it was used as a residence for the bishops and was almost completely destroyed in a war shortly after. The only remaining original pieces – the tower and part of a wall – can be seen today. Luckily for us, it was rebuilt and can be visited for the amazing views of the countryside, guided tours, and a restaurant! Ambräusianum is the blue place and Schlenkerla is JUST hidden from sight two doors down! As a bonus, you can’t visit Bamberg (or this region of Germany) without thinking about trying some beer. There are over 10 breweries in Bamberg – each producing their own style of beer. Some have been at it for centuries. Most notably, in the middle of the Old Town, you will find two very popular breweries: Ambräusianum or Schlenkerla. Right on the corner, Ambräusianum has great beer, traditional Franconian food on the menu, and a great atmosphere. Located basically two doors down is arguably the most famous brewery in the whole of Bamberg – Schlenkerla. While the brewery was first talked about in the early 1400s, today, the place is as popular as ever. It is actually a UNESCO World Heritage site! Here you can try Smokebeer” or “Aecht Schlenkerla Rauchbier” which is still tapped from the wood barrel like it was centuries ago. The smokey aroma and flavour comes from the malted barley which is dried over an open flame. We didn’t get a chance to try since we were pressed for time and would have wanted to really enjoy the beer and the experience. There were loads of people trying a pint outside even though the weather wasn’t great the day we visited. And there you have it – our rundown of Bamberg! Of course, we only had the better part of a day but we loved checking out the city. It basically just made us want to visit again! Eric is a little disappointed we didn’t try the smoke beer so we will be back for that and let you know how it goes! Let us know if you explore Bamberg – we’d love to hear about it!